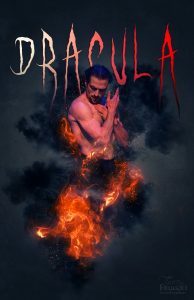 Central Illinois Ballet, in residence at Illinois Central College, presents two performances of Dracula: Dance on the Dark Side on October 28 and 29 at 7:30 pm in the ICC Performing Arts Center in East Peoria. There will be a costume contest at each performance. Tickets are available at ciballet.com. The Central Illinois Ballet (CIB), a new in-residence ensemble at Illinois Central College for 2016-2017, brings a resident professional ballet company back to Peoria with a sensational season premiere featuring two performances of Dracula: Dance on the Dark Side. Performances will feature Central Illinois Ballet professional dancers, as well as guest dancers from around the country, and will be held October 28 and 29 at 7:30 pm in the ICC Performing Arts Center, located on the East Peoria Campus. The Central Illinois Ballet was formed from its official training school, Cornerstone Academy of Performing Arts, and had always been the vision of Von Rathonyi. CIB is the result of three highly successful seasons of performances by the Cornerstone Academy performing ensemble. The group’s board of directors, recognizing the demand for professional ballet performances in Central Illinois, formed the Central Illinois Ballet in January 2015. CIB consists of a resident company of 10 professional dancers, four trainees and five regular guest artists. CIB also has a vast network of contacts of adjunct guest artists that have appeared with the company. The group’s goals are to provide professional level ballets at affordable prices and raise awareness for ballet in Central Illinois. Also appearing in Dracula will be members of CIB’s senior and junior company ensembles, who are current students at Cornerstone Academy and are pursuing a career in professional dance. For these students, CIB productions offer them the unique opportunity to dance alongside professional company members and learn firsthand what dancing in a professional company is like. Malachi Squires will also be making his return to Peoria to reprise his role as Dracula. “As an artistic director, we are always looking for ways to improve upon our work, whether it be in your choreography, staging, story, or costumes,” Von Rathonyi states. “That’s how we grow as human beings. That’s how our dancers improve and how our productions stay fresh. Central Illinois Ballet is hosted as an in-residence ensemble by the Arts at ICC, which has a rich history of enhancing the arts community and expanding education beyond the classroom. Arts at ICC presents more than 500 exhibits, performances, lectures, rehearsals, meetings, master classes, clinics, seminars, receptions, orientations, forums, auditions and tournaments annually. For information about tickets or the event, visit ArtsAtICC.com or call the box office at (309) 694-5136. There will be a costume contest at each performance and winners announced at the end of each show. Audience members are encouraged to wear their best Halloween costumes and help get attendees in the spirit of the season. Seating for the performances is general admission. Tickets cost $18 for the general public and $10 for students. Tickets are available at ciballet.com or cornerstoneballetpeoria.com.